J/News Articles: Young Girl Skippers J/34 Fast! (Sandusky, OH)- The J/34 IOR “KNEE DEEP” is at it again, sailing offshore on Lake Erie with kids! Shocking! And, NO video games and NO cell phones! Even more shocking! 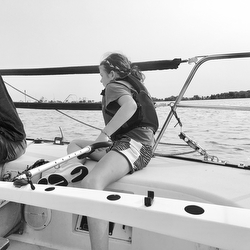 As many of you know in the global community of J/Sailors, Brett Langolf makes every attempt to include his young son and daughter on any regatta that he and his wife sail with friends on a classic, super-fast, light-air, IOR-designed, J/34 on Lake Erie. They do many weekend and “beer can” races with everyone involved. Every minute spent offshore without your kids texting or gaming is about an hour’s worth of love and communication! Recently, Brett posted a pic that would have most parents beaming from ear-to-ear with pride. Said Brett, “here’s my daughter Hadley, 10 yrs old, driving a kite reach last week off the shores of Cedar Point on a “Sunday Funday” race aboard KNEE DEEP. We all had a blast!” Add to Flipboard Magazine.